Ta daaaaah! As promised there will be a new recipe here each week between now and the new year – and first up is this gem of an ice cream that I created last year for the good people at Fisher & Paykel and Dish magazine. I am so excited to finally share it, because it really is such a bloody delicious and easy solution to Christmas dessert. 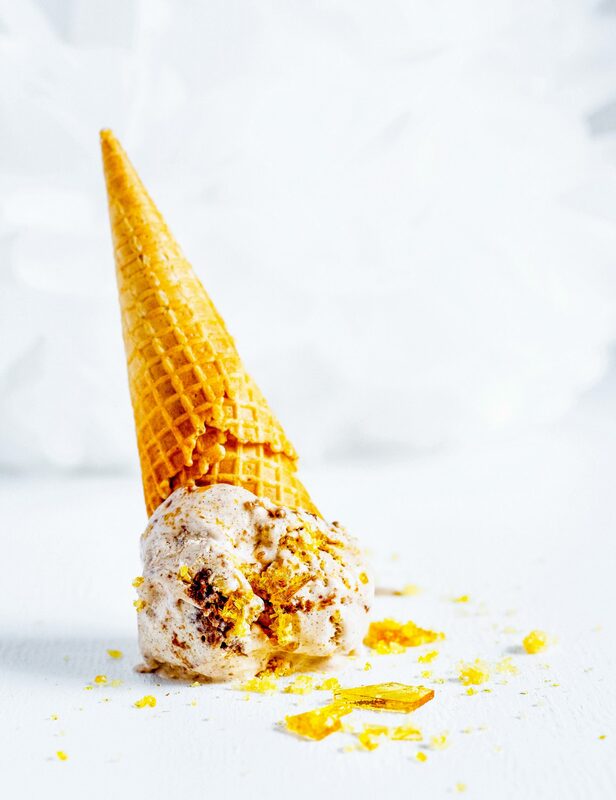 The ice cream tastes like Christmas – with whisky (or brandy), ginger, figs and cinnamon all blended together in a luscious creamy base, and the praline provides that extra little bit of festive sparkle to make it even more fancy! Put the figs in a saucepan with the brown sugar, whiskey, water and ginger. Simmer over a gentle heat, stirring occasionally, for 35 minutes or until the mixture forms a thick paste. (Mash it with a fork to encourage the figs to break down). Take the fig paste off the heat and allow to cool. Put the cream into a large bowl with the cinnamon, vanilla bean seeds and brown sugar and whip to firm peaks. Add the brandy or whiskey and condensed milk and beat together until smooth. Stir in most of the chopped walnuts and pour into a 1 litre capacity container and freeze for 2 hours. Poke holes in the soft ice cream and drop in big blobs of fig paste then use a knife to swirl it through then sprinkle with the remaining walnuts. Freeze for another 5 hours or over night. Serve the ice cream either in small bowls with fresh summer fruit or in cones with a sprinkling of golden praline for festive Christmas cheer. Line a small baking tray with baking paper. Whisk the water and sugar together in a medium saucepan. Cook over a medium heat for a few minutes, whisking as the sugar dissolves, then brush any sugar on the sides of the pan into the water with a pastry brush, and don’t whisk again. The sugar will go through several stages: first it will dissolve, then become white and crystallised, and finally it will start to turn lightly golden and liquid. Gently swirl the saucepan at this stage to encourage even cooking. Once it is an even light golden colour (similar to honey), pour it out on to the prepared tray. It is viscously hot and will continue to darken in colour even once poured. It doesn’t take long to cool, then smash it into large pieces with the end of a wooden spoon or rolling pin and/or blitz in a food processor to your desired texture; from large and chunky to a golden powder. When do you add the brandy or whiskey to the ice cream?